It's been 11 years since the Microsoft launched Windows XP. It's probably been the best most popular system to date. However, all good things come to an end and with Windows Vista, 7 and now 8 released since Microsoft have decided to call it a day for XP from 8th April 2014. There will be some final updates to fix problems and security issues but after that there will be no more updates. Well that it about to change with the launch of the new Computer and IT services Trade Organisation ( CITS) on 29th March 2013. It sets out to vet all companies that register with it and expects them to adhere to a code of conduct to make the trage more professional and easier for customers to know they are dealing with a bona fide company/individual. 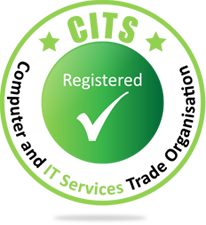 The PC Guy is pleased to announce we will be signing up and once all checks have been completed we'll be fully registered and vetted in the scheme. To check out the website go to www.cits-trade.org which tells you all about the scheme. Once we are fully registered the logo will be proudly displayed on the front page of the website and all material. It's a big change from earlier versions of windows. Not least because on the desktop it has no "Start" button. It's a lot trickier to find the parts of the system you used to find easily. Well there is a way around this. Search Google for "Windows Classic Shell" and download then install the file. Hey presto, the start button is back in all it's glory. Need help then give me a call. Microsoft is switching off its Windows Live Messenger service on 15 March. On that date Messenger log-ins will no longer work and users must turn to Skype, said Microsoft in an email sent to all Messenger users. The email also encouraged users to update to Skype and familiarise themselves with the service before the switch-off. The service switch is a consequence of Microsoft's acquisition of Skype in October 2011 for $8.5bn (£5.3bn). To help people migrate before 15 March, Microsoft has added an upgrade button to its desktop Messenger that when clicked uninstalls Messenger and puts Skype in its place. When you fire up your machine you get a half or full page screen telling you your computer has been locked by a Police Force's elecrtronic crime unit due to you being found looking a untoward stuff etc. It then asks you to puchase 100 ucash to get your machine unlocked. This is a complete scam to get your credit card information. The police do not ask for money. If you'd been looking at the kind of sites it suggests you'd have already been paid a visit no doubt and be behind bars. If you get this scam then give me a call for an affordable removal service. To avoid it all you can do is make sure you have decent and up to date anti-virus. Consider purchasing a active anti-malware system to go alongside your anti-virus such as the one at www.malwarebytes.org. Solid state drives (SSD's) have been around a while but the cost of one with a decent size has put this out of the reach of most. Some companies have tried the hybird approach, a normal hard disk with the storage you need but some built in solid state memory to pre-load common applications to get a speed boost. Whilst quicker than standard drives they still did not reach the speeds SSD's can. In the last couple of months the prices of SSD's have really dropped. For example you can now get a 120GB SATA III drive for £60. Whilst not a massive size compared to you 500GB or 1TB drives. In a PC it can be your windows drive and all your data can go on another bigger normal drive. These drives in laptops have the added bonus of using less power, therefore extending your battery life and there is none of those little clicking noises, drive sounds you normally hear. Though that was often a good way to tell things were happening. 1) To get the best speed benefit your PC or laptop needs to support the SATA III or SATA 6GB/s interface. You will still get a benefit with the SATA I or SATA II but not to the same standard. So check your machine before you buy one and wonder why it's not that much quicker. 2) SSD drives SHOULD NOT BE defragged. There is no need first of all as all data access is instant. Also, if you do defrag it reduces the life of the drive. By the end of the year we could be seeing bigger drives for more affordable prices too so keep an eye out. The speed difference really is amazing. One-in-10 second-hand hard drives still contain the original user's personal information, suggests an investigation by the UK's Information Commissioner's Office (ICO). It purchased devices from auction sites such as eBay and computer fairs. Of the 200 hard disks collected, 11% contained personal information. At least two of the drives had enough information to enable someone to steal the former owners' identities, the watchdog said. A separate survey by the ICO indicated that one in 10 people who had disposed of a mobile phone, computer or laptop had not wiped the device. 21% of users now chose to sell their old mobile phones, computers and laptops rather than get rid of them, it suggested. It added that the trend was even more common among 18-24 year-olds among whom the figure rose to 31%. "We live in a world where personal and company information is a highly valuable commodity," said Information Commissioner Christopher Graham. "It is important that people do everything they can to stop their details from falling into the wrong hands." The ICO's study adds to other evidence highlighting the risks of identity fraud. Over the last three months the UK experienced a 40% increase in the problem when compared to the same period the previous year, according to research by industry fraud body CIFAS. It says there were nearly 34,000 cases in which criminals used a victim's name, address or other information to steal money or attempt to steal it. Banks and their customers were affected as well as phone companies and home shopping networks. Most of the damage is being done online, the result of spam emails, computer infections or carelessness, allowing scam merchants to gain access to personal details. And there are instances of mail being intercepted and criminals sifting through the contents of rubbish bins to look for useful information. In the majority of cases banks or other businesses will bear the initial loss from fraud, though the cost can feed through to higher prices. For its investigation, the ICO employed computer forensic firm NCC Group to source and scour around 200 hard drives, 20 memory sticks and 10 mobile phones. Nearly half (48%) contained some information. 11% of the devices held personal information. Among the 34,000 files found were scanned bank statements, passports, information on previous driving offences and some medical details. Four of the hard drives came from organisations rather than individuals and contained information about employees and clients, including health and financial details. All four organisations had been contacted, and had subsequently taken action to securely erase data on old equipment, the ICO said. One - Safe and Secure Insurances Services Limited - has agreed to introduce further improvements. "People are in danger of becoming a soft touch for online fraudsters," warned Mr Graham. "Many people will presume that pressing the delete button on a computer file means that it is gone forever. However this information can easily be recovered." Its report claims that about 600,000 Macs have installed the malware - potentially allowing them to be hijacked and used as a "botnet". The firm, Dr Web, says that more than half that number are based in the US. Apple has released a security update, but users who have not installed the patch remain exposed. Flashback was first detected last September when anti-virus researchers flagged up software masquerading itself as a Flash Player update. Once downloaded it deactivated some of the computer's security software. Later versions of the malware exploited weaknesses in the Java programming language to allow the code to be installed from bogus sites without the user's permission. Dr Web said that once the Trojan was installed it sent a message to the intruder's control server with a unique ID to identify the infected machine. "By introducing the code criminals are potentially able to control the machine," the firm's chief executive Boris Sharov told the BBC. "We stress the word potential as we have never seen any malicious activity since we hijacked the botnet to take it out of criminals' hands. However, we know people create viruses to get money. "The largest amounts of bots - based on the IP addresses we identified - are in the US, Canada, UK and Australia, so it appears to have targeted English-speaking people." Dr Web also notes that 274 of the infected computers it detected appeared to be located in Cupertino, California - home to Apple's headquarters. Java's developer, Oracle, issued a fix to the vulnerability on 14 February, but this did not work on Macintoshes as Apple manages Java updates to its computers. Apple released its own "security update" on Wednesday - more than eight weeks later. It can be triggered by clicking on the software update icon in the computer's system preferences panel. The security firm F-Secure has also posted detailed instructions about how to confirm if a machine is infected and how to remove the Trojan. Although Apple's system software limits the actions its computers can take without requesting their users' permission, some security analysts suggest this latest incident highlights the fact that the machines are not invulnerable. "People used to say that Apple computers, unlike Windows PCs, can't ever be infected - but it's a myth," said Timur Tsoriev, an analyst at Kaspersky Lab. Google has begun issuing warnings to millions of people that their PC has been infected with a virus. The malicious code pipes browser traffic through sites that promote the scammers' wares which include fake security programs. Google uncovered the huge number of infected machines while doing routine maintenance on a data centre. During maintenance, Google servers get taken offline and typically this means search traffic for that cluster of machines dries up. However, wrote Damian Menscher on the official Google blog, switching off one cluster did not stop all traffic. Investigation revealed that the traffic was being generated by a virus on perhaps a million Windows machines. The virus bounced packets of data off the net address of the Google servers to find out if they were online. "The malware appears to have gotten onto users' computers from one of roughly a hundred variants of fake anti-virus, or 'fake AV' software that has been in circulation for a while," wrote Mr Menscher. So far, said Google, it has warned "hundreds of thousands" of users and expects to notify many more. The results will be collated and offered via a clickable map to give the first glimpse of what a 3G UK really looks like. Veteran tweeter Stephen Fry has given the project his backing, encouraging "UK Androiders" to download it. Epitiro, the data measurement firm that developed the app, said it had addressed concerns about battery drain. "We have a new version of the app which doesn't test continually but for four hours at key points in the day. It stops testing if battery life drops below 30% but can test continually when a phone is being charged," said Iain Wood, a spokesman for Epitiro. The app will provide data to show where the UK's 3G notspots are. Coverage is one of the biggest issues for consumers, according to regulator Ofcom, and it is due to publish its own survey in coming weeks. Some BBC readers were delighted that the issue of coverage was finally being addressed. "Great idea! Have installed the app on my phone and will watch the results with interest," commented one. Some expressed frustration that the app was only currently available for Android handsets. "How many people in the highlands have Android phones? asked one annoyed reader. "Android users are tech savvy and will be working/living in an area with good reception. After all if they had poor reception they wouldn't buy a smartphone, Android or otherwise, in the first place," pointed out one reader. Brendan Gill, co-founder of rival app opensignalmaps thinks the Epitiro app should also measure download speed. "It only measures signal strength and that is a limited metric," he said. Speed tests conducted by Epitiro on behalf of Ofcom found that O2 and Vodafone were the fastest UK operators, averaging between 2 and 3Mbit/s, compared to Orange which managed between 1Mbit/s and 1.5Mbit/s. Google+ allows individuals to share photos, messages and comments but also integrates the company's maps and images into the service. It also aims to help users easily organise contacts within groups. But some analysts say Google has simply reproduced features of Facebook while adding a video chat function. Google, which handles roughly two out of every three internet searches in the US, has taken several stabs at Facebook in recent years. But its previous efforts ended in failure, with both Google Wave and Google Buzz proving unpopular with users. Sparks - a feature that connects individuals on the network to others with common interests. The current version of Google+ has only been released to a small number of users, but the company has said it soon hopes to make the social network available to the millions of individuals that use its services each day. "Online sharing needs a serious re-think, so it's time we got started," Vic Gundotra, senior vice president of engineering at Google, said in a press release. "Other social networking tools make selective sharing within small groups difficult," she added, taking what appears to be a jab at Facebook's recent grouping function. But some analysts have said Google could have a difficult time converting Facebook devotees to their new social network. "People have their social circles on Facebook - asking them to create another social circle is challenging," Debra Aho Williamson, principal analyst with research firm eMarketer, told the Associated Press news agency. "The whole idea of a Google social network... they've been throwing stuff against the wall for several years and so forth nothing has stuck," she added. In April, Google reached an out-of-court settlement with a US policy group over its rollout out Google Buzz, a previous social effort. Called Office 365 the service puts the familiar e-mail, word processing, spreadsheet and collaboration programs on the web. Microsoft said the programs will be accessible via desktops, laptops and tablets plus Microsoft, RIM, Apple and Android smartphones. The launch is aimed squarely at Google and others who already offer web-based business software. Office 365 is being formally launched on 28 June via events in New York and London. The service unshackles the well-known programs from a single PC and translates them into a web format. Charges for the service are based on the size of the business that wants to use it Small businesses with fewer than 25 employees will pay £4 per user per month for secure access to e-mail, calendar, documents and contacts. Larger organisations will pay from from £6 to £17.75 per user, per month and get a broader range of extras including advanced archiving, unlimited storage and Microsoft's Lync messaging and communications system. Customers using Office 365 can host the applications they are using in Microsoft's data centres, use dedicated servers in those centres or put the programs on their own hardware in their own data centres. Office 365 takes the place of Microsoft's current web-based offering for firms known as the Business Productivity Online Standard Suite. Office 365 stands separate from the web versions of Office which features cut down versions of the familiar programs. The move to the cloud is seen as a gamble by Microsoft because much of the cash generated by Office comes from sales of software installed on desktop PCs. Switching to the web could dilute this cashflow which is responsible for about one-third of the company's revenue. However, a web option is seen as essential in order to combat the growing threat from Google and others that are starting to poach Microsoft customers. "Windows and Office are the two foundations of Microsoft's profitability and this is kind of messing with one of them," said Jeff Mann, a VP of research at analyst group Gartner. "It's definitely a very big bet." Before the official launch of Office 365, Google put a post on its Enterprise Blog comparing its Apps service with Microsoft's offering. Shan Sinha, Google Apps product manager, wrote that it was better to start with a new technology rather than add extras to an ageing one. "Technology inevitably gets more complicated as it gets older," he wrote. "Upgrading platforms and adding features results in systems that are increasingly difficult to manage and complex to use." In the blog post he runs through the differences between the two services, saying that Google Apps is about teams, the web and choice but by contrast Office 365 was for individuals, desktop PCs and other Microsoft-specific technology. "You can't just take legacy, desktop software, move some of it to a data center and call it "cloud. "," he said. "Apps was born for the web and we've been serving hundreds of millions of users for years." If your hard disk fails and you don't have the license number you'll need to buy a new Windows disc. Quite often I find laptops have the stickers on the underneath and they eventually wear away becoming unreadable. Make a separate note of it and keep it safe. It'll save you a lot of money in the long run. If you’ve never installed a service pack before, it’s just a big collection of fixes and changes for your operating system, bundled into a big fat download to make it more convenient if you reinstall—if you’ve kept Windows updated, it should have most of the fixes already installed through Windows Update. Whether you were going to ask these questions or not, we’re giving you the answers that you really need to know. •Where Do You Download It? While you can download the service pack manually from the Microsoft Download site, you should probably just go through Windows Update and select the optional SP1 update from there, since it’ll only download exactly what you need. More on this below. •It’s in Windows Update? Will I Get it Automatically? Nope. It’s an optional update (at this point) in Windows Update, so you’ll only get it if you choose to install it. •Does This Make You More Secure? If you haven’t installed anything off Windows Update in a while, first, shame on you! It’s important to keep yourself updated! Also, this release is essentially a big fat roundup of all the security fixes and bugfixes since Windows 7 was released, combined with a few extra bits of functionality. If you have Windows Update set to automatic, the service pack will not make you more secure. •How Long Does It Take to Install? The installation time isn’t terribly long, about 30 minutes, but depending on your internet connection, it’ll take quite a while to download. Your best bet is to start the install and then walk away for a while. •Should I Drop Everything and Install it Today? Not unless you’re bored or you haven’t run updates in a long time. There’s very little in terms of new features, and you’d be better off waiting until the download rush is over. There’s also the possibility of problems, so you might want to wait. If you do want to download it directly, you can do so from the Microsoft Download site. •Improved HDMI audio device performance: there’s a small update that helps reliability of HDMI audio devices after rebooting. This is listed as a feature in the release notes, but really feels like a bug fix. •Corrected behavior when printing mixed-orientation XPS documents: If you’re trying to print XPS documents that have landscape and portrait pages in the same document, now they will print correctly. All 5 of you can now rejoice. •Change to behavior of “Restore previous folders at logon” functionality: If you used the “Restore previous folders at logon” feature in Folder Options, the folders would restore into a cascaded set of windows. Now they will restore to where they were. •Support for Advanced Vector Extensions (AVX): supports a newer processor extension that improves performance for floating point intensive applications. •Improved Support for Advanced Format (512e) Storage Devices: hard drive manufacturers are transitioning to a new 4KB physical sector size, and now Windows 7 supports this better. There’s a lot of other bugfixes and security fixes, but these are the most notable ones according to Microsoft’s documentation. Demonstrations of Windows 8 running on tablets, phones and desktop computers were given at separate conferences in the US and Taiwan. As expected, the software can be used via either traditional keyboard and mouse or by gestures on a gadget's touchscreen. No date has been given for the release of Windows 8 but it is expected to be available before October 2012. Toolbars in Internet Explorer are great but sometimes you can end up with loads of them. Quite often they get installed along with some free software you've downloaded or installed. These all take time to load when you open your browser and can also impact on your browsing too. So, if you don't use a toolbar, hit the x on it's left side and disable it. There are loads of add-ons too installed. In the tools menu go to manage add-on's and disable the ones you don't use. Hopefully, your browser will load quicker and be quicker.